The 70’s was a period in Australian Rock Music when the industry’s top acts could also be seen at the annual Sunbury Music Festival. On each Australia Day Weekend from 1972-1975, crowds of 35,000 or more would camp at the picturesque site 30 minutes from Melbourne, anticipating a full rocking of their socks from Australia’s own rock’n’roll icons. But the very first Sunbury – an all Australian affair showcasing the talents of the day – is the most fondly remembered by those that made the pilgrimage. Where else could you see Chain, Lobby Loyde and Max Merrit on the same bill? 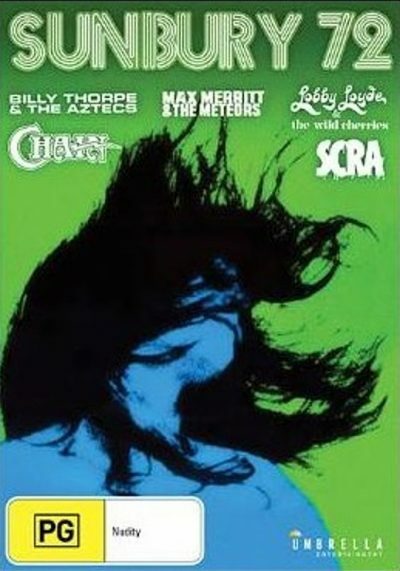 And where else but Sunbury would Billy Thorpe and the Aztecs debut ‘Most People I Know Think That I’m Crazy’? In 1972 – post Woodstock but years before The Big Day Out, Sunbury was an event not to be missed. This film serves as a reminder of that first festival in 1972, and captures the spirit of Sunbury’s ethos – “”to have a good time””. So join your host Molly Meldrum – dressed in the style of the times – and sit back, relax, crank up the volume, and stroll down memory lane to Sunbury.